Turn on some music and feel the pain subside. What?! Listening to your favorite artist won’t fix what’s ailing you but music therapy has been found to be effective in treating chronic pain! Music therapy is the use of music to help improve individuals’ physical and emotional health. Using music to improve people’s health and state of mind has a long history. Evidence of this can be found in the Bible, in stories of Egyptian gods and throughout history. Many musical therapy techniques originated as methods for educating children about music. These methods such as Orff-Schulwerk, Kodaly Method and Dalcroze Eurhythmics were found to have additional benefits such as motor skill development, perceptual functioning and academic performance. The use of these methods has since evolved to include music therapy. Music is used to help individuals of all ages. Specific therapy techniques involving music are designed specifically to help premature babies physically and emotionally mature in the NICU. Children with autism are thought to respond positively to music therapy. During adolescence, music can be used to treat mood disorders and help with inappropriate behaviors. 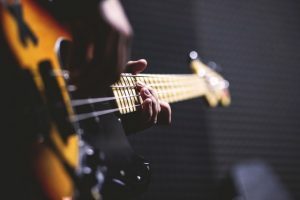 Adults with psychiatric disorders have been shown to improve more when music therapy was added to traditional therapy methods. Elderly individuals suffering from dementia or Alzheimer’s are commonly treated with music therapy to help with cognitive function and social behaviors. The use of music therapy spans the globe. Why has it been used for so long and so extensively? It probably has something to do with its wide range of benefits. Studies have shown that music therapy can have a positive impact on chronic pain. Researchers are unsure whether this is due to a physical effect (ie: through the release of endorphins) or an emotional one (ie: by creating a distraction for the individual) but most agree that it can help. In addition, in most cases, there are no negative effects of music. This has us left saying, why not? Turn the radio on and enjoy yourself, maybe you’ll ease the pain a bit…or at least forget about it for a little while.